Once all the other avenues of dispute resolution have been exhausted - discussing it, taking it to the dispute resolution noticeboard, a request for comment, the administrators' noticeboard for incidents, and finally the Arbitration Committee - and the problematic user has been blocked, banned, rangeblocked, and bitten by muffins until they've gone mad and is still disrupting the encyclopedia, or perhaps the admins were just a bit short on fun that day - said user will be forced into contributing to the noble task of making cereal. We may think of cereal as wholesome, nutritious and yummy, and the first thought that springs to mind when you read those words is probably that they are sent off to work in cereal factories or something of the sort, but those are misconceptions, fed by the Wikipedia admins to support the idea that their actions in this area are reasonable. In fact, the cereal is not made by the users, but from them. What do I mean, you ask, in a vain effort to deny the obvious truth? I assume you have heard of Soylent Green, and you know that it is made of people. The same is true of cereal. 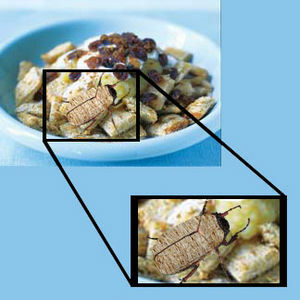 This picture was faked in an attempt to show that cereal is made from insects. It is most certainly not. You may be wondering how I know this, if you are not already aware of who I am. I have made many such users into cereal myself; Wikipedia is not a place to have fun, and as an administrator I have so far been unable to have any kind of life outside Wikipedia, and as making users into cereal is a break from the usual routine, I happily embraced it once I learned that it was an accepted practice. It may seem appalling to you, but for me it has been my only escape. The only side-effect is that I can no longer eat cereal with a clear conscience, now that I know how it is made. Made from people who don't deserve to be labelled 'nutritious' or 'delicious', and whom I would rather not interact with again even in the form of something claiming to be food. At least, this is what we have all been led to believe, this is what we must believe to get where we are and stay there. But this is not true, I have realised; realised again, after suppressing it out of necessity: no one deserves to be made into cereal, and many who meet that fate were not even deserving of the steps that were taken before it. The policies governing these things speak truth and common sense, but as even they are not set in stone, they are freely ignored. There is an alternate version of this article at Cereal/old. I have forgotten why I was able to find cereal-making fun. Perhaps it was because I already had too much experience with doing awful wiki-things to people, and so my conscience had become buried under layers of wikidirt. Or perhaps it was because having essentially no life and constantly dealing with Wikipedia this and Wikipedia that had driven me crazy...yes, I think that was it. And the being crazy started before I was an admin. You have to be crazy, I know now. Or not know what you're getting into. Wikipedia is constantly full of things that only we can handle, because so many people are using it and putting annoying things in it, and then you have to go and deal with them, but most of the time someone will think you did it wrong, especially if you did it to them or their article (but not always), and they'll give you hell over it. So you end up being given hell practically all the time, which means that Wikipedia ends up being hell, and you go crazy. You start wanting to make others suffer the way you do. So you turn to making them into cereal. At least that's what I did. With everything one does on Wikipedia, one must provide evidence. If it's an article, you have to cite your sources, if it's a dispute over something, you have to provide diffs of the disputed behaviour. There is no such evidence for the process of making cereal, however, which I suspect will render this a useless piece of writing - but I don't care about that now. I've had enough of citing my sources for everything. Some things have no sources but are still true, and the world needs to know. Even if it is original research. This is entirely original research, and yet I am merely stating facts, can you believe it?! I refuse to think about it any longer. I do not want to be crazy any more. With this statement that I have written by accident but will publish anyway, I am ending my time at Wikipedia. I have had enough of the lies and the disgusting, unethical actions I have helped to perpetuate, including but not limited to the aforementioned cereal. I expect the other admins will write blocks of text about how I have gone mad and must be desysopped faster than you can say Jack Robinson, but that is why this is not for their ears eyes. This is for everyone else who has not yet hardened into a piece of deplasticised plastic, those whose lives might be saved by reading this. I cannot undo what I have done but, if my voice is heard, I can prevent it from happening in the future. Wait, Uncyclopedia is a...content-free encyclopedia? Stuff has to be funny? Oh dear. I expect the Uncyclopedia administrators will either delete this article or fail to take it seriously. I hope for the latter, because, at least that way, it will still be there, if it may only be crying out into the darkness, shining a light where no light may shine. But at least I have tried. ↑ Yes yes of course they're reasonable, please don't read what I'm about to write, don't eat me! AAAAAAAAA! ↑ I see that your policies here are called 'ignorable policies', but it seems that you do not in fact ignore them. Quite the opposite of our situation. No, I should not say 'our'; by writing what I have written I have essentially committed wikisuicide, and from now on I will be an outcast, looked upon as nothing more than someone who went completely off the rails. But that does not change the fact that everything I say is true, and I trust that those with an open mind will see the truth and be saved from a horrible death at the hands of those who were my peers. ↑ Though on second thought, perhaps they might open their minds, if given a chance. I did; why wouldn't they? This page was last edited on 9 June 2014, at 20:59.